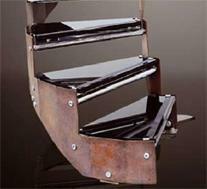 Every Edilco creation can be made with the acclaimed special steel COR-TEN which ia a weathering steel. ‘Weathering’ means that due to their chemical compositions, these steels exhibit increased resistance to atmospheric corrosion compared to unalloyed steels. This is because the steel forms a protective layer on its surface under the influence of the weather. COR-TEN has a corrosion-retarding effect. The protective layer is produced by the particular distribution and concentration of alloying elements in it. The layer protecting the surface develops and regenerates continuously when subjected to the influence of the weather. In other words, the steel is allowed to rust in order to form the ‘protective’ coating..